The baby monitor is in working order. Brand new, been used once, comes with original packaging. Lila Video Baby Video Baby Monitor is new in a open box. LEVANA LV-TW502 Baby Monitor W/2 Cameras, Working! Introducing Oma Sense, Levana’s simplest movement monitor that monitors your little one’s breathing movements and alerts you when no movement is detected. WakeUp Technology In the event that no breathing movement is detected for 15 seconds, Oma Sense will initiate fluctuating vibrations, LED lights and audible alerts to stimulate baby and encourage the return of regular movement. Levana Lila Video Baby Monitor Tested and Working! Up for your consideration is this Levana Lila Video Baby Monitor! Tested and Working! BRAND NEW just an open box. Baby Video Monitor Astra Digital Talk Intercom Night Vision Levana New. Shipped with USPS mail. Fits Levana Willow, Shiloh, Milo, Amaria and Aria units. Sound / Motion Detection: Yes. Monitor Display: 5” LCD. Two-way Audio: Yes. Battery: up to 8 hours of continuous use; up to 12 hours in power save mode. This camera is compatible with our Alexa video baby monitor only. Alexa is expandable up to 4 cameras. Private Digital Signal We know how important it is that your signal remains strong and unique to your handheld monitor. Encrypted digital proprietary signal and channel hopping ensure that your connection remains private and without interception. With 500ft transmission range, you can check in from anywhere in your house or yard. Cord for camera. Will not work on monitor screen or dock. The ClearVu Digital Video Baby Monitor is a wireless video baby monitor with ClearVu digital technology which lets you see and hear your baby. ClearVu Digital Technology. Wireless video baby monitor with ClearVu digital technology. 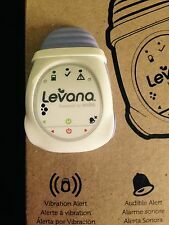 levana baby monitor With Color Screen In Good Condition! Condition is Used. Sold as is, see pictures for details. We know how important it is that your signal remains strong and unique to your handheld monitor. With 150ft optimum transmission range, you can check in from anywhere in your house or yard. Invisible LED Night Vision. Gently used. Worked great. My baby started rolling over REALLY early so I can no longer use. Includes a new battery and storage case. This camera is compatible with Shiloh, Willow, Amara and Aria video baby monitors only. These systems are expandable up to 4 cameras. Private Digital Signal We know how important it is that your signal remains strong and unique to your handheld monitor. Encrypted digital proprietary signal and channel hopping ensure that your connection remains private and without interception. With 500ft transmission range, you can check in from anywhere in your house or yard. USED IN GOOD WORKING CONDITION. This is our #1 goal and we will do anything reasonable to achieve that. levana baby monitor. Condition is Used. Shipped with USPS Priority Mail. The Levana® Lila 2.4" Video Baby Monitor is useful for keeping an eye on your little one in the still of night. 2-way intercom included. Allows you to see your baby in complete darkness up to 12' away. Lullabies, Nature Sounds & White Noise. Temperature Sensor with Customizable Alerts. Talk to Baby Two-Way Communication. Missing battery and battery cover. Works with plug in only. The antenna is loose and is being held on with duct tape. All functions work properly. Patented one-handed clip operation for simple attaching, adjusting and removing. Invisible infrared LEDs provide a clear image of your child in the dark up to 12' away. Zoom in with 2x magnification and keep a close eye on baby. You’ll see everything that’s happening in the nursery with the included wide-angle lens. That way, you can see the whole room and know what your little one is up to at a glance. Use the buttons on the parent unit to pan and tilt side to side and up and down, so there’s no angle of the nursery you can’t see. Invisible infrared LED night vision provides a clear image of your child in the dark up to 12 feet away. Two-way Talk to Baby™ intercom alerts you when baby's fussy and allows you to calm your baby with the sound of your voice. Missing manual and case. We are honest people and will work to correct any mistakes. The original boxes maybe a bit beat up. Includes unit pictured. We are honest people and will work to correct any mistakes. The original boxes maybe a bit beat up.